They were a livestock outfit frim Indiana, Havn`t seen them for a long time, Don`t know if they are still around. We only had one terminal in Indiana and that was one of our smaller terminals, I can't remember what town it was in because I was never stationed out of there. Our headquarters was only 64 miles away from the town I lived when I drove for them and still live here. The main terminal was in Holdrege Nebraska and the second largest one is the one I was stationed out of for the longest time, Grand Island Nebraska. We had over 550 trucks at one point and we were always the largest livestock haulin' outfit in the world. We ran Freightliner cabovers and conventionals, Volvo cabovers and conventionals, International cabovers and conventionals, Kenworth cabovers, and White cabovers. Our trailers were mostly Barretts, but we had, Wilsons (gosh I hated them Wilsons), Merritts (I loved them Merritts), and Guthries. The configurations were either 48 foot tandems, or 53 foot spreads, and we ran all over the US but stayed mainly in the west/midwest. And we went out of business in July of 2008 but I quit in 2005 when things started getting bad. We were also called Big Foot for a while but the name soon went back to Speedway. Life is hard, Truck it up. Thanks for the interesting update . I seen you all on the road but I never knew much about the company. It must have been fun hauling those Go Go Girls around ! No problem man, it sure was a pleasure pullin' for them. 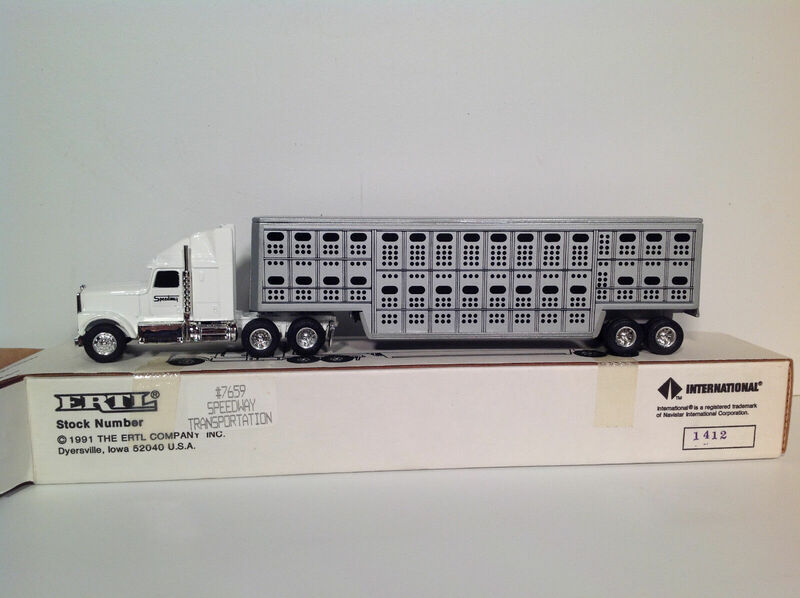 I am still bullhauling but I now owner-operate for MRK out of Lexington Nebraska. Still hauling livestock though. 20 years of doing it and still going strong. Brian - I checked out your terminal on Google Earth ... it looks like a nice operation ! You mean like these guys? Yes! I have 2 of those trucks, Speedway gave them to us drivers who have drove for them for more than 10 years. I can't believe you found a picture of one of those models saying less than 100 of them were ever made, even those there were 400 or so company drivers lol. I've had a half-dozen of them come through my collection in various points of my collection. I know there were two versions, one had an all-gray/silver trailer and one had a white trailer with gray-silver cattle pot decals. Yep. I have both versions of them. I am going to have to dig mine out of my closet from my box of hats and stuff I got while I was driving for them. Are there any other pictures of the Speedway model trucks you have?